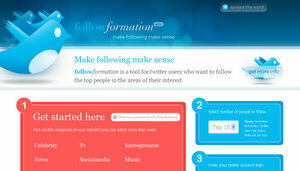 Followformation helps users quickly follow dozens of categorized Twitter users. This tool is meant for Twitter users that would like to make sense out of following. Followformation helps the social media newcomer simplify the first few steps by dividing the top people on Twitter by categories, and automating the entire following process. Users are able to choose their categories of interest and preview the people in these categories. Users can also create a custom category if it is not on the current top list. Followformation is the creation of Aer Marketing Inc..
To learn about what is new from Followformation, simply follow the updates on Twitter @followformation.